Pan Pan is a panda who was rescued from starvation in the wild when he was a cub, in 1986. Since then, he has gone on to father 120 of the 520 pandas alive in captivity. 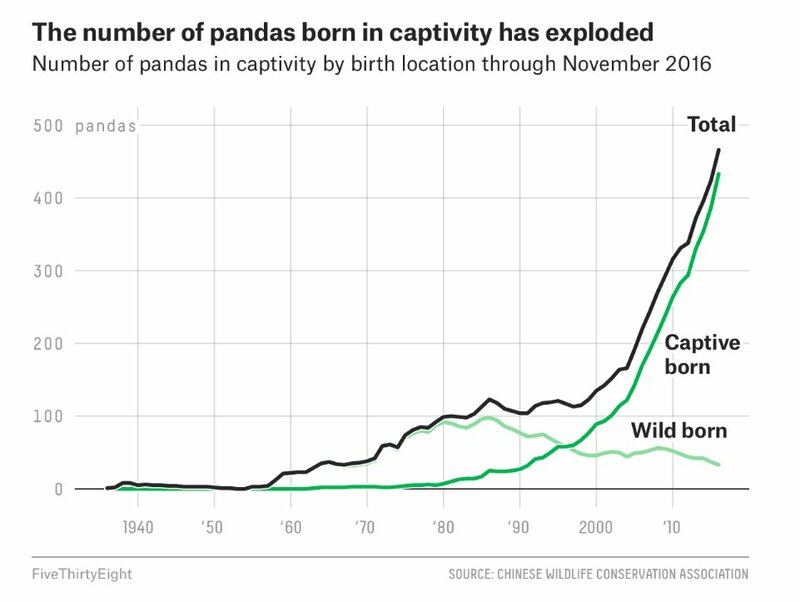 Pan Pan appears to have succeeded in captive mating in part because of a higher than normal libido (or lower than normal standards), and while he was responsible for a total rethink of the pandas' captive breeding program, which brought the species out of endangered status, he's also created an enormous shift in the genome of the species. Partly that's just the obvious fact that when a quarter of a population has the same father, their genomic variation will be reduced -- but partly it's because the captive breeding lessons that Pan Pan taught his keepers has created a breeding program that reproduces the kind of pandas that do well in zoos -- that lie down and urinate on command, that submit to medical exams, that don't attack keepers who are feeding them, and, of course, that mate in front of humans. Maggie Koerth-Baker's long piece on captive breeding, reservations, genetic bottlenecks and unintentional domestication is a great guide to the very thorniest issues in endangered species mitigation. Some of the greatest success stories of conservation science are tinged with this irony. Take the California condor, a species that was down to 22 individuals in 1982 before scientists began breeding them in captivity and releasing them to the wild. At the end of 2016, there were 276 of them flying free. But that kind of resuscitation is not exactly the same thing as healing the patient. We bred condors and released them back into the wild, sure. But we never banned the lead shot that turned what the condors eat — animal carcasses — into deadly poison. Today, Beissinger says, every “wild” condor is tracked by radio collar, regularly recaptured and tested for its lead levels. We feed them, too — a delivery service of lead-free dead cows. Our efforts straddle the line between ensuring the species survives and ensuring it can fend for itself like a truly wild thing. And the number of species that could end up in this kind of situation is growing. There isn’t really a coordinated, global effort to monitor biodiversity on Earth and, as a result, it’s difficult to definitively say whether there are more species in need of rescue today than, say, 40 or 50 years ago. But increased efforts to understand and prevent extinction during that time period have meant more species documented, counted and officially recognized as being at risk. And thus, there are more species we have to sit down and figure out how to save.